Ghosts do not exist in real life, but there is nothing stopping us from enjoying a film about them! 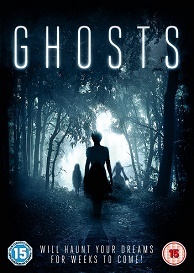 Ghosts is out on DVD on 27th June! and to celebrate we have a great competition for you and 3 copies to win. Six contestants win a competition to appear on a LIVE reality TV show at a secret location in rural England. The next ten hours will be spent on a paranormal investigation with a TV crew, searching for the truth behind ghost stories that haunt an old railway station museum. But something evil awaits them and soon they'll discover that they are not alone.